Wet Felting Wool: Add Color & Texture the Easy Way! How to easily add color and texture to your felt fabric. The good thing about being snowed in is that I’ve finally been able to do a little wet felting again. It’s so relaxing for me. I get lost in the luscious fibers and colors! Over my years of teaching wet felting, I’ve had many people say that they don’t know what colors to put together. 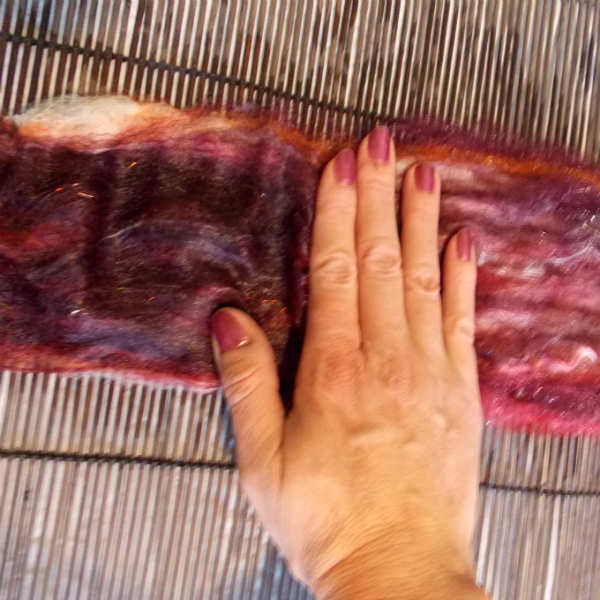 It seems to be a challenge for some so I wanted to show you a quick and easy way to add lots of beautiful color and texture to your felted pieces by using Carded Batts. If you’re a beginner feltmaker, you may be interested in What is Felting? A Complete Beginner’s Guide. Did you see my other Wet Felting Tutorials? What the heck is a Carded Batt? 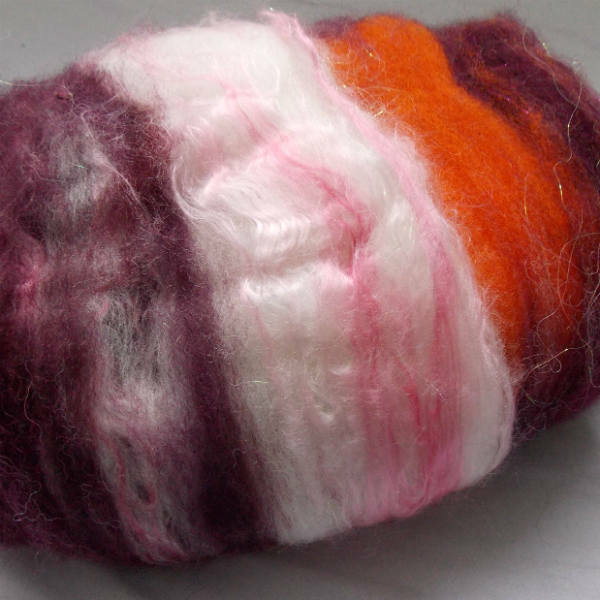 It’s fiber that has been blended with a drum carder, mostly for spinning purposes. One of these bad boys …. Are you breathing?? Yes, they are very expensive! If you are going to do a lot of spinning it may be a worthwhile purchase. The good news is, you can just buy the carded batt! 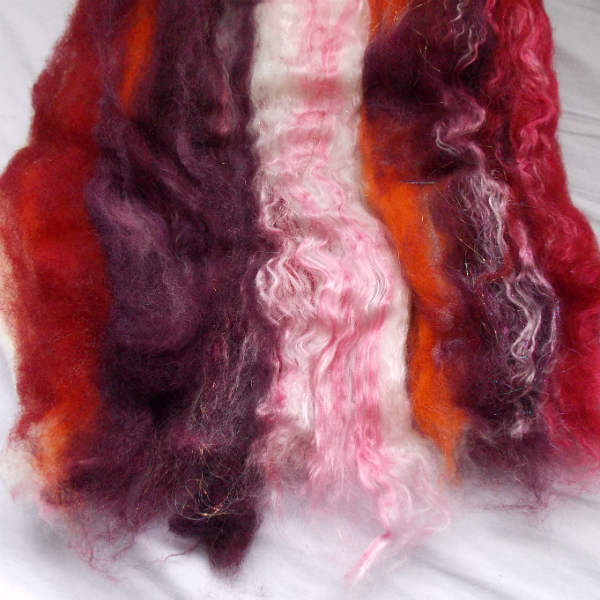 My batt was a mixture of hand dyed alpaca roving, fine merino, bamboo, silk and a bit of angelina glitz for some sparkle. Take your time with this step. Don’t worry if you accidentally pull the fibers apart completely. Just put it back, overlapping the edges. It will felt together just fine. Fill your bottle with hot water and add a few squirts of the dish soap. Gently shake and then generously sprinkle the water on your layer of fiber. 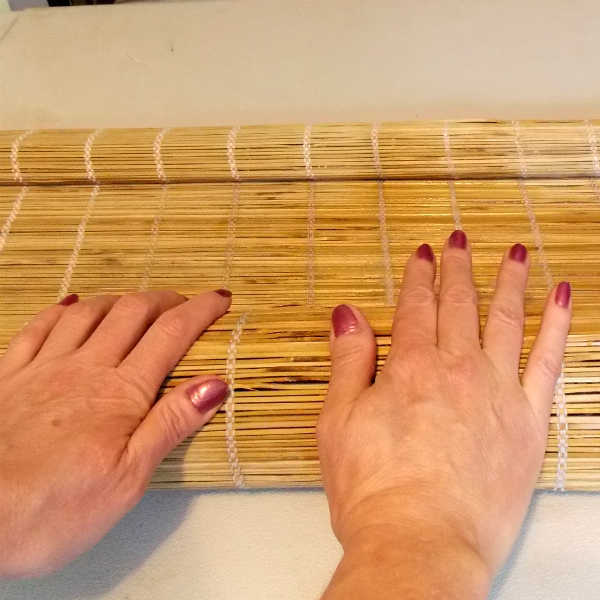 Next, place your hands flat on the fiber and move them slightly back and forth. You want to work the water into the fiber without moving the actual fiber too much. Add more water if needed. Make sure all of the fiber is thoroughly wet because dry pockets of fiber will not felt. Unroll the package and check the felting progress by doing a pinch test. Just like it sounds, with your thumb and forefinger, pinch a bit of fiber and gently pull up. Is it holding together? If yes, move on to the next step. If no, continue rolling. If you read my other wet felting tutorials, you know what’s next….throwing! This will full your fiber, meaning it will shrink and complete the felting process. Remember, at this point, your scarf is still very soft so handle it GENTLY! You don’t want to stretch out the holes too much. So, very very carefully, pick up your scarf, wad it up and let it fall on the table. No force here, just gently let it drop. Pick it up and drop it again. Do this about 50 times. Now, carefully lay it out and pull apart any areas that are not supposed to be sticking together. You’ll know it when you see it. Continue throwing your scarf until it’s holding together well when you pull on the fiber. It will give, but shouldn’t come apart. You will also notice that your fiber has shrunk and puckered. Rinse out all of the soap and hang your felt up to dry! Voila! 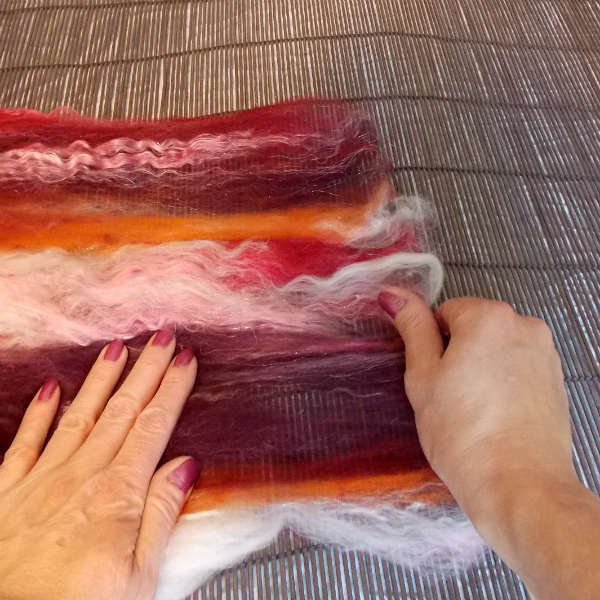 You can use this technique to make stunning felted scarves, shawls or wallhangings. The possibilities are endless.